The District and Parish Council provide dog waste bins around the area. 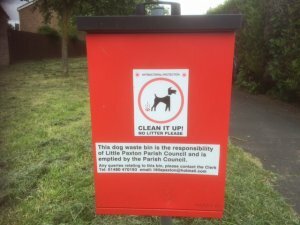 The Parish Council own and maintain five dog bins in the village- two on the QEII Playing Field, one at Gordon Road/High Street, one at Gordon Road Sweeting Avenue and one at Samuel Jones Crescent opposite Marbled White Court. The Parish bins are emptied twice a week. There are also dog litter bins at Paxton Pits Nature Reserve.